Dr. Stefan Huck, Director, German Naval Museum, Wilhelmshaven. He stands in front of the stone for the torpedo boat, V.4., the last Jutland wreck found. In March 2016. 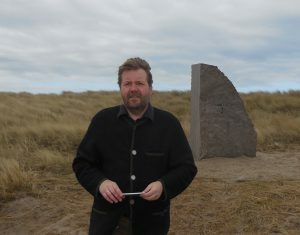 Visiting Gert Normann Andersen’s new Sea War Museum in Thyborøn, north Jutland (Denmark) with Nick Jellicoe, Dr. Stephan Huck is seen standing by the memorial stone for the torpedo boat SMS V.4. She was one of the two last ships found from the battle of Jutland and only gave up her watery secrets to Gert’s expedition where Dr Innes McCartney helped find her in March 2016. For both of us this was a moving moment. The location, next to the North sea, lies only 80 miles from where the guns of battle were heard by villagers on the beaches that day.